These pumpkin swirl brownies are made with cream cheese and taste as if pumpkin spice cheesecake swirl collided with chocolate fudge brownies. 1. Preheat the oven to 325°F (163°C). Butter a 9-by-13-inch (23-by-33 cm) baking dish. 2. In a stand mixer or in a medium bowl with an electric mixer, beat the cream cheese and butter for 30 seconds. Add the sugar and beat to combine. Beat in the egg, pumpkin, vanilla, cinnamon, and ginger. Stir in the flour. 3. In a small bowl, whisk together the flour, baking powder, and salt. In a large saucepan over low heat, combine the chocolate and butter and warm until melted and smooth, stirring occasionally. Gradually add the sugar, beating just until combined. Beat in the eggs, one at a time. Add the milk and vanilla. Gradually add the flour mixture and stir just until combined. Spread the chocolate brownie batter evenly in the bottom of the baking dish. Spoon the cream cheese mixture in mounds on top of the chocolate brownie batter and use a table knife to swirl it into the chocolate batter. Bake until the center is just set, 55 to 65 minutes. 4. Remove the brownies from the oven and let them cool in the baking dish. Cut into squares. 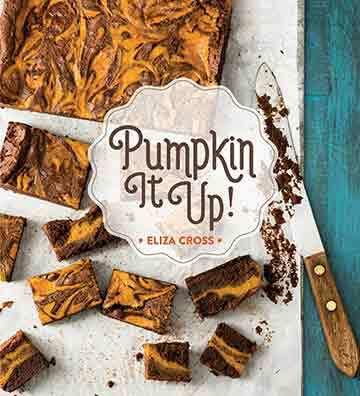 Pumpkin Swirl Brownies Recipe © 2016 Eliza Cross. Photo © 2016 Susan Barnson Hayward . All rights reserved. All recipes and photos used with permission of the publisher.